Iyke has been our chef since we began operating in 2000. Liz, part owner and manager, and Iyke have worked together since the mid 80’s years with a previous tenure at another bonefish lodge on Andros. During the time we are closed in the off season, Iyke travels to work with chefs in other resort and restaurant kitchens. These travels keep Iyke fresh and inspire him to add new dishes to the menus every season. Iyke is frequently asked for recipes and is always happy to oblige. We keep our kitchen well stocked with a variety of fresh, fine quality food, and supplies. Most of our dinner menus are based on fresh local seafood. Fishermen really do pull up at our dock with their catch to allow Iyke to make his selections. Lobster, grouper, snapper and conch all make regular appearances. We practice healthful cooking such as limiting fried foods, serving mostly seafood grilled or poached, and using only fresh fruits and vegetables. We also offer classic cuisine, Bahamian favorites & indulgent deserts such Iyke’s well known Key Lime Pie. Iyke is one of the first staff members you will meet upon your arrival and we encourage you to make your food preferences known to him. We post the planned dinner menu every morning before you go fishing so that you may request a different entrée if you wish. Coffee and tea delivery is now available between 6:00 am and 6:15 am. 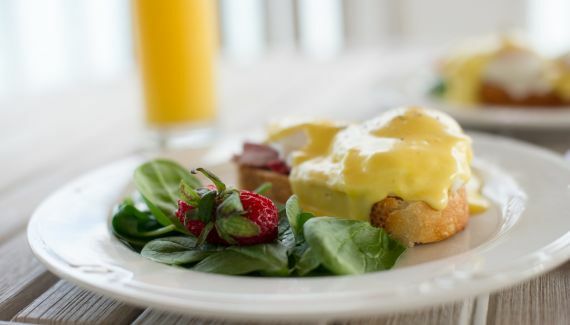 Breakfast begins at 6:30 am with coffee made from freshly ground beans (roasted for us in Nassau), an assortment of teas, fruit juices, cold cereals and fresh milk, yoghurt, fresh fruit and freshly baked pastries (muffins, biscuits, bagels). Hot breakfasts of eggs, bacon, sausage, grits, pancakes or French toast are served beginning at 7:00 am. Feel free to request anything you like – hot oatmeal or a fruit salad perhaps? Lunches are packed in coolers of ice and taken out on the boats. We invite guests to create their own lunches from a selection of breads and rolls, tuna salad, ham, roasted turkey breast, smoked turkey, salami,roast beef, beef bologna, with cheeses, lettuce, tomatoes, cucumbers and onions and of course, peanut butter and jelly. A fresh green salad is also an option. All are laid out buffet style so you can make your lunch to your preference. Freshly baked cookies, granola bars, potato chips, and fresh fruit complement the selection and make for a great lunch. Snacks are on the bar when you come in from fishing and can be a bowl of mixed nuts, freshly made guacamole with just fried tortilla chips and salsa, seasoned potato chips, cheese and fruit plates, pates, crackers and dips or quesadillas. Our bar is well stocked with beer, house and premium wines, quality liquors, liqueurs and sparkling waters. Most beer, wine, liquors, and mixers are complimentary. We do charge for premium wines and liquors. You are also welcome to bring them with you. Dinner begins with hors d’oeuvres at cocktail hour, 6:00 pm. Cracked conch, conch fritters, grouper nuggets, stone crab claws, hot lobster dip, crudités and chicken wings are some of the items you will find on the hors d’oeuvres table. Dinner begins with a salad or a soup. Some of our favorite soups include Bahamian conch chowder, cream of lobster, ginger and carrot. 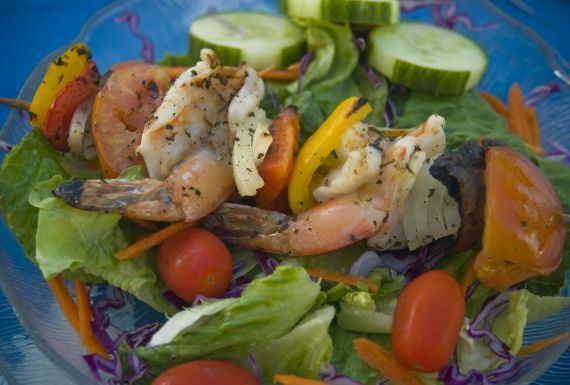 Our House Salad of crisp greens with a variety of salad vegetables, Caesar, spinach and grilled shrimp salad with mango dressing are some of the salad course offerings. 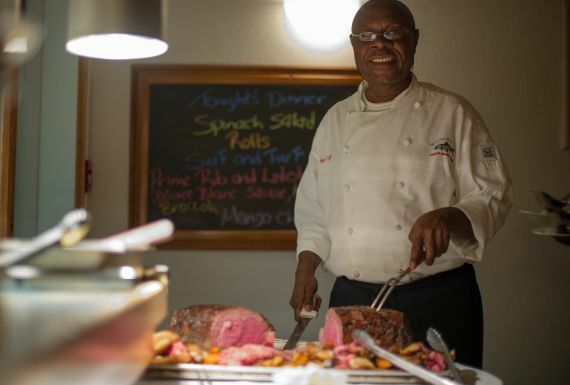 Seafood entrees are Iyke’s specialties, and he prepares fresh fish and lobster to perfection. 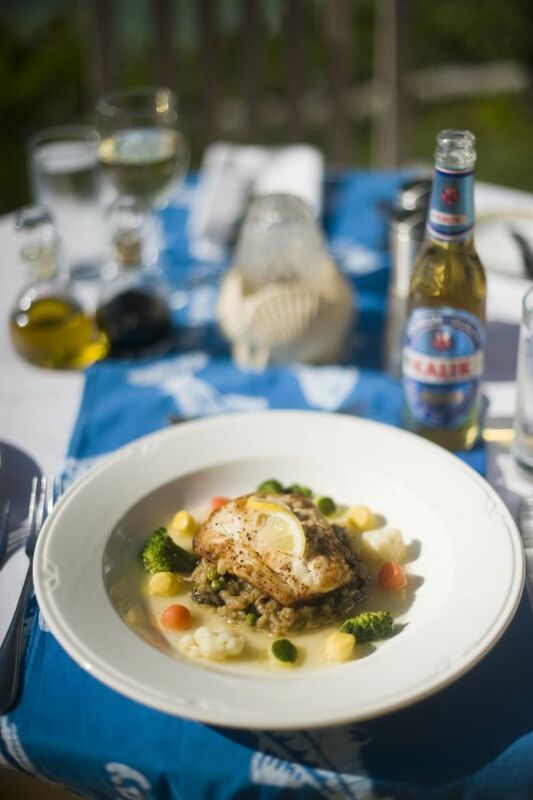 Grilled fish with fettucine, sauteed grouper in lemon broth with risotto, grilled lobster in cognac sauce, and snapper in pineapple sauce are some of the dishes you will see posted on the menu board. All deserts are homemade. In addition to Iyke’s killer key lime pie, desserts include Grand Marnier Soufflé, mango cheesecake, coconut pies, homemade ice cream, and outrageously fudgey brownies served with ice cream and chocolate sauce. A selection of red and white house wines are poured with dinner and the list includes chardonnays, pinot grigio, sauvignon blanc, cabernet sauvignon, merlot, shiraz, and pinot noir. You may also choose from our premium wine list. We are constantly seeking to be fresh and innovative in our food preparation and presentation and each season we make additions and changes to our menus. Guests consistently praise Iyke and the products of his kitchen which result from his high standards and careful attention to the suggestions, requests and preferences of our guests. In short, the quality of Iyke’s cuisine matches the quality of the bonefishing.